The Disappeared by Western author C.J. Box is Joe Pickett’s 18th adventure. This popular series features the Wyoming game warden, his family, and his complicated friend Nate Romanoski. Three of the best things about Box’s Joe Pickett series are the return of engaging and complex characters; beautiful and harsh settings; and at least one issue that pits the Old West against the new and changing West. Each book highlights a few characters who are important in Joe’s life. In The Disappeared, eldest daughter Sheridan and Nate Romanoski share leading roles. Sheridan is a recent college graduate and is taking a year to decide what she wants to do next. Nate, a master falconer, has contacted Joe because a few of his fellow falconers could use Joe’s help. Because it is very rare that Nate needs Joe’s assistance, he agrees to meet. Joe’s wife, Maribeth, director of the Twelve Sleep County Library, provides research support mostly out of the range of the action this time. 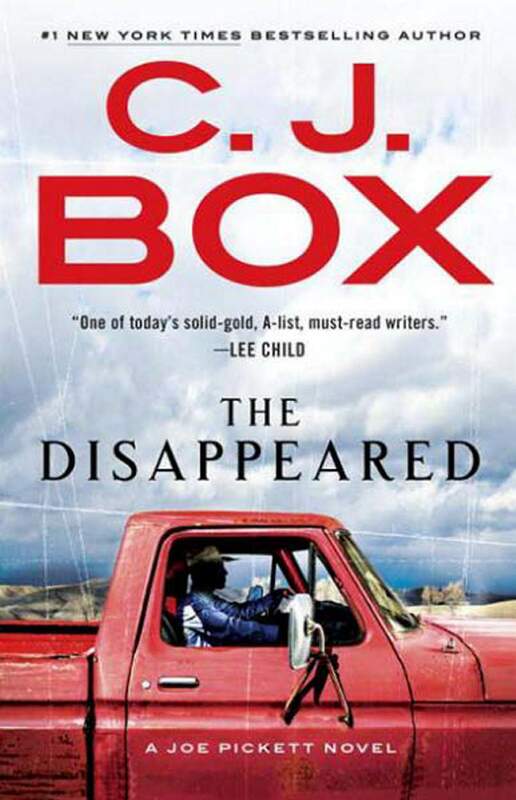 Box also introduces several strong secondary characters who live in and near Saratoga, Wyoming, where the action takes place in The Disappeared. Joe’s new adventure is prompted by a flyby visit from the new governor of Wyoming. Before, Joe had an arrangement with the previous governor: When there was trouble around the state, Joe would be sent in to try and take care of things. His performances earned him the unofficial title of Range Rider. He also has the dubious tile of trashing more state motor vehicles than any other employee during these adventures. This time, it appears that last summer a British tourist, Kate Shelford-Longden, a CEO of a prestigious advertising agency, disappeared after her stay at a ultra-exclusive resort/dude ranch located about 300 miles south of Joe’s home base in Saddlestring. This just happens to be the same place where Sheridan is working as a wrangler. Because horse riding is one of the favorite activities on the ranch, Sheridan’s job is considered a plum assignment. After Joe arrives in the area, he discovers some surprising and puzzling events. One of the most disturbing is the mysterious disappearance of the local game warden. This actually gives Joe his cover because he can claim to be the temporary replacement for the local warden. As Joe begins his investigation, he discovers the development of a gigantic wind farm that is going to be the largest in the country. This enormous enterprise is creating jobs for many people in a part of the state that is small and rural without many economic opportunities. He is under pressure to either find the missing woman or what happened to her because the tourist and resort industry in the state will suffer from such bad press that people could stay away. As Joe continues trying to follow the cold trail, more strange events vie for his attention. From the small event of a dog being run over to a terrible car accident involving a local woman and then trying to follow leads of local contractors who visited the guest ranch, he is being pulled all over the area. The interweaving of these suspicious activities leads Joe to take help from both Nate and Sheridan to try and bring closure to the disappearance of “Cowgirl Kate” as the British tabloids have named her. Box has crafted another thriller with many surprising twists and turns. Taking Joe to another part of the state allows the author the opportunity to showcase more of the harsh beauty of Wyoming. Box also gives a fascinating view of life at a fancy resort. His talent for creating new, fascinating characters is well highlighted in The Disappeared. As usual, Joe seems to get himself in trouble even as he tries to help others. The Disappeared is a gripping thriller that should appeal to readers who love tales from the Wild West.